It’s nearly impossible for recent design graduates to find work now. Companies are producing more with fewer staff, while recent grads have to compete with laid-off, more experienced baby boomers for open positions. The post also includes some sobering advice to fashion design students – advice that anyone who’s in a graduate program in the arts, humanities, and some social science fields would do well to consider: be prepared to fund yourself, be open to unpaid internships (see my post about unpaid internships which speaks to some of the privileges that inhere in this system of apprenticeship), and if all else fails, have a Plan B.
I’ve been thinking and writing a lot about labor in relation to fashion, in particular, and the creative economy, in general. Most recently, I wrote a post about the free labor that the new fashion media complex depends on and hinted at the more complex issues of copyright law. This is a subject that deeply concerns not only fashion bloggers but also subscribers of blogs who provide content to fashion blogs in the form of daily outfit images submitted to blogs such as Chictopia, Lookbook, etc. as well as, as Meg of Good Morning Midnight so eloquently points out in her comments to my post, those working in or trying to find employment in traditional fashion media as journalists, professional models, and ad copy writers. The sad state of employment makes it difficult to understand another, seemingly conflicted reality about the creative economy (and note that “employment” is not the same thing as “work” – as I’ve noted before, free labor is a driving force of the creative economy). Urban studies scholar Richard Florida, to name one of the most vocal theorists of the “creative class,” has argued that now more than ever before creative laborers play a significant role in economic development and urban regeneration. While many have criticized his findings as classist (he focuses on a privileged class of “high bohemians” and neglects the experiences of the greater majority of the creative proletariat), I would also add that Florida doesn’t seem to fully understand the situation of digital free labor in relation to the new creative economy. That is to say, while creativity and innovation are highly valued today, they are not always or often financially compensated. Bloggers and others providing free digital labor do so for a lot of reasons (many of them having to do with personal pleasure and the love of communication and the arts) but not least of these reasons is the hope that these free digital labors will one day lead to paid employment or some other form of monetization. And for some star bloggers and haul vloggers, it has (to varying degrees). Once marginal on the landscape of production, it is artists, designers, and other creatives who are becoming the new model workers – self directed, entrepreneurial, accustomed to precarious, nonstandard employment, and attuned to producing career hits. All of these features are endemic to a jackpot economy, where intellectual property is the glittering prize for the lucky few. It is the potential of this glittering prize of somewhat stable employment where an individual’s work is granted all kinds of validation including legal and economic protections that keeps so many working upwards of 12 hours a day, seven day a week on their blogs, vlogs, etc. for free. 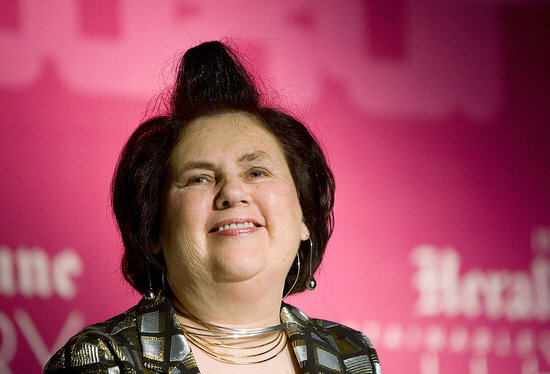 Melissa Tan, a blogger for the San Francisco Examiner has a short write-up of Suzy Menkes’ talk at the Academy of Art University in SF last Thursday. I intended to go but got caught up with a journal article I’m working on (about digital labor, what else?) and so missed the entire event. I’m hoping that someone videotaped the hour-long conversation with the strange title “If fashion is for everyone – is it fashion?” but haven’t yet found it anywhere.